Just in time for Halloween, a large space rock that bears an eerie resemblance to a skull will zip past Earth this weekend. Scientists observing asteroid 2015 TB145 with NASA’s Infrared Telescope Facility (IRTF) on Mauna Kea, Hawaii, have determined that the celestial object is more than likely a dead comet that has shed its volatiles after numerous passes around the sun. The belated comet has also been observed by optical and radar observatories around the world, providing even more data, including our first close-up views of its surface. Asteroid 2015 TB145 will safely fly by our planet at just under 1.3 lunar distances, or about 302,000 miles (486,000 kilometers), on Halloween (October 31) at 1 p.m. EDT (10 a.m. PDT, 17:00 UTC). The first radar images of the dead comet were generated by the National Science Foundation’s 305-meter (1,000-foot) Arecibo Observatory in Puerto Rico. The radar images from Arecibo indicate the object is spherical in shape and approximately 2,000 feet (600 meters) in diameter and completes a rotation about once every five hours. 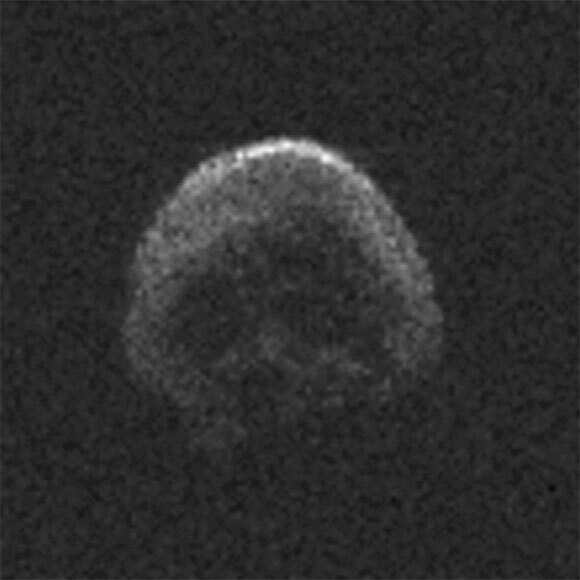 “The IRTF data may indicate that the object might be a dead comet, but in the Arecibo images it appears to have donned a skull costume for its Halloween flyby,” said Kelly Fast, IRTF program scientist at NASA Headquarters and acting program manager for NASA’s NEO Observations Program. Managed by the University of Hawaii for NASA, the IRTF’s 3-meter (10 foot) telescope collected infrared data on the object. The data may finally put to rest the debate over whether 2015 TB145, with its unusual orbit, is an asteroid or is of cometary origin. Asteroid 2015 TB145 was discovered on October 10, 2015, by the University of Hawaii’s Pan-STARRS-1 (Panoramic Survey Telescope and Rapid Response System) on Haleakala, Maui, part of the NASA-funded Near-Earth Object Observations (NEOO) Program. The next time the asteroid will be in Earth’s neighborhood will be in September 2018, when it will make a distant pass at about 24 million miles (38 million kilometers), or about a quarter the distance between Earth and the sun. NASA places a high priority on tracking asteroids and protecting our home planet from them. In fact, the U.S. has the most robust and productive survey and detection program for discovering near-Earth objects (NEOs). To date, U.S.-funded assets have discovered over 98 percent of the known NEOs. NASA’s Jet Propulsion Laboratory, Pasadena, California, hosts the Center for Near-Earth Object Studies for NASA’s Near-Earth Object Observations Program within the agency’s Science Mission Directorate. Be the first to comment on "“Skull Shaped” Asteroid 2015 TB145 Will Flyby Earth This Halloween"